A symmetrical fire-rated cavity barrier designed to provide compartmentation of larger concealed spaces (extensive cavities) within a building. By offering 120 minutes' integrity and 38 minutes' insulation (to BS 476-20 and BS 476-22), VALBARR® 120:30 exceeds the minimum requirements relating to cavity barriers as detailed in the Building Regulations (E&W) Approved Document B. It is manufactured using specially woven/ treated glass fibre fabrics and a patented laminated insulation layer. The barrier contains no respirable fibres, is lightweight, easy to fit and requires no specialist tools or fittings. Easy to manipulate and cut to shape. Movement Joints Assessment No. 363521. Pipe Protection Assessment No. 363520. Timber Protection Assessment No. 363519. BS 476 part 6:1989 Class 0 (Fire Propagation). BS 476 part 7:1987 Class 1 (Surface Spread of Flame). ISO 1182 1990 (E): Non Combustibility. IMO Resolution MSC.61 (67) Part 1. Non Combustibility. 120 minutes' integrity and 38 minutes' insulation. 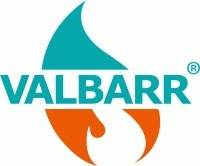 VALBARR® proprietary food safe non-corrosive chemical treatment with added benefit in helping prevent fibre migration. The product information below is from the NBS Plus library of product clauses offered in NBS specification products. It has been created by NBS for Valbarr. Each product clause is authored in NBS format and is intended for inclusion in project specifications. Please note that NBS product guidance is not a replacement for the manufacturer's literature and it is recommended that Valbarr be consulted before specifying.